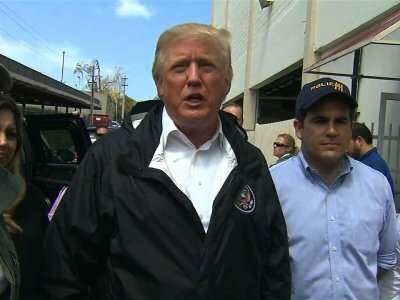 SAN JUAN, Puerto Rico (AP) — Touring a small slice of Hurricane Maria’s devastation, President Donald Trump congratulated Puerto Rico on Tuesday for escaping the higher death toll of “a real catastrophe like Katrina” and heaped praise on the relief efforts of his administration without mentioning the sharp criticism the federal response has drawn. “Really nothing short of a miracle,” he said of the recovery, an assessment at odds with the despair of many still struggling to find water and food outside the capital city in wide swaths of an island where only 5 percent of electricity customers have power back. The governor of Puerto Rico said late Tuesday that the official death toll has been increased to 34 from 16. “Thank you for being here, it’s so good to see you,” one man said in Spanish. Up the road in the upscale Guaynabo neighborhood, one of the fastest to recover, around 200 people cheered Trump’s visit to a local church being used to distribute supplies. Many crowded around him for cellphone photos as he handed out flashlights and tossed rolls of paper towels into the friendly crowd. “Again, the job that’s been done here is really nothing short of a miracle,” he said.